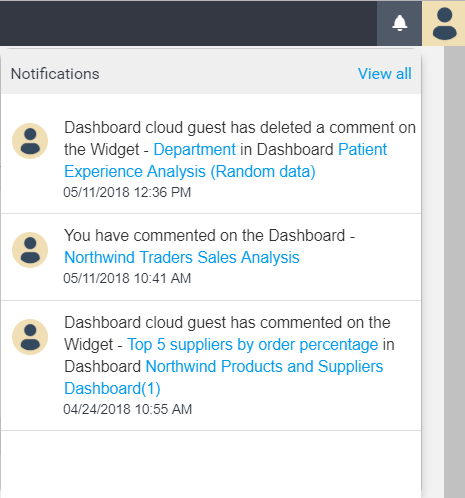 This section explains on how to configure notifications to notify the users for comments on the Dashboards and Widgets in the Syncfusion Dashboard Cloud. Notifications can be configured by both the System Administrator and the user. 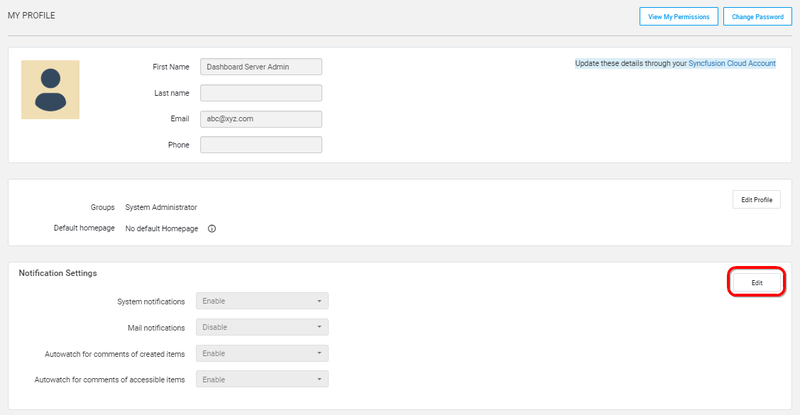 Configure how the users receive notifications for the comments from the admin notification settings page. Let’s look at the notification settings one by one. System notifications are the ones that will appear in the top right before the user name once the user logged into the Dashboard Cloud as like in the below image. Users will also be notified through email for comments. This is a switch for watching the comments of the items that the users have created. Enabling this will send notifications for comments on all the items that the users have created. This is a switch for watching the comments of the items that the users have access. Enabling this will send notifications for comments on all the items that the users have access. Now, let’s look at the default and allowable notification settings configuration. This is the master settings for the Dashboard Cloud. Upon enabling or disabling any setting in here will enable or disable it in the Dashboard Cloud. This will override the default and user settings. Configure how the current user receive notifications for the comments from the user notification settings page. Users can navigate to this page from the profile edit page as shown in the below image. Refer to the below image for changing the notification settings for the current user. Settings can be enabled or disabled or inherited from global settings which is the default settings of the Dashboard Cloud. Apart from autowatch of created and accessible item settings, users can also watch on a specific item if they want to watch an item specifically. Users can toggle between watch and unwatch for a Dashboard comment anytime.